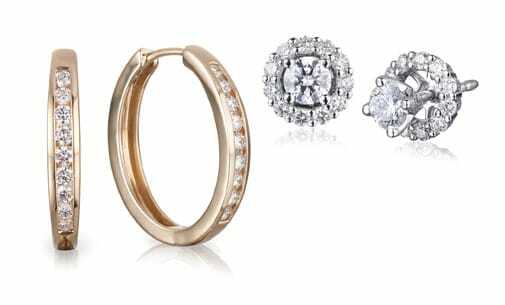 Whitakers’ collection of earring designs are crafted using luxurious white and yellow gold and come in a variety of styles including stud earrings, hoop earrings and drop earrings. With delicate designs and breathtaking impact, Whitakers’ diamond earrings will accentuate any look. Or choose from Whitakers’ shimmering coloured earrings to add a touch of sparkle to your day or evening wear. Synonymous with sophisticated design, Whitakers’ collection of eye-catching hoop earrings are a timeless staple for everyday wear, while classic diamond stud earrings will keep you in style for years to come. For something a little more dramatic, consider Whitakers’ intricate and opulent diamond drop earrings, which add a wow factor to any ensemble. Style them with matching necklaces, rings or bracelets or wear them as standalone statement pieces. With an extensive range of earrings suitable for every occasion, there is an earring for every woman at Whitakers. Browse our collection of stud, hoop, drop, diamond and coloured earrings online or visit our Darby St boutique in Newcastle.